Proposition 65, also known as the Safe Drinking Water and Toxic Enforcement Act, is intended to help better equip Californians to make informed decisions about the products they purchase. The OEHHA is responsible for determining which chemicals meet the legal and scientific requirements for inclusion on the Proposition 65 list, a list which has grown to more than 900 chemicals since it was originally published in 1987. The new law will be enforced by the California Attorney General’s Office as well as any district attorney or city attorney for cities whose population exceeds 750,000. Individuals acting in the public’s interest may also seek to enforce Proposition 65 by filing a lawsuit against companies alleged to be in violation. Companies that are found to be in violation may be fined as high as $2,500 per violation per day. To ensure compliance with the new law, food manufacturers must reference the list of included chemicals to determine which of their products, if any, are impacted. Manufacturers must then provide “clear and reasonable warnings” that chemicals used in the production of their goods or products sold in California are known to cause cancer, birth defects and/or other reproductive harm. The ruling impacts goods sold in California as well as those sold via catalog or the internet. Proposition 65 underscores the importance of an agile labeling environment for food manufacturers, particularly as it relates to their ability to adjust labels prior to compliance deadlines. It also implores manufacturers to look to automation to reduce the room for human error. 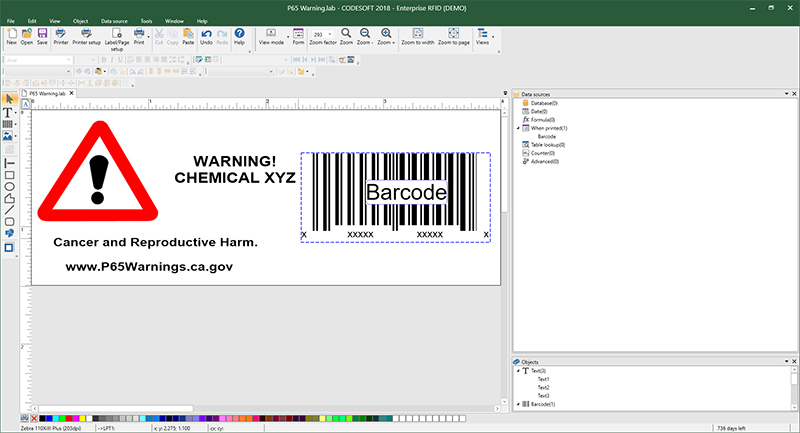 For example, labeling software can be leveraged to create a table look up so if an impacted ingredient is included in a product and printed on a label, the required warning statement is also automatically included on the label. Leveraging a database connection to apply such warnings can help businesses mitigate risk, as failing to include a required warning could result in fines, business disruption and lost revenue. It is also important to note that compliance with Proposition 65 will require food manufacturers to stay up to date on changes, as new chemicals may be added and/or revisions to law may continue to occur. Food retailers must also stay abreast of labeling changes required by Proposition 65 to ensure the products they sell are in compliance. Learn more about Proposition 65 at the OEHHA’s official website: https://www.p65warnings.ca.gov. Label design products can help a company add a warning statement to a current label. Image courtesy of TEKLYNX.